Death Note is hands down my favourite anime of all time, I absolutely love the idea behind it, and think Light is perfect as the flawed hero; a tragic character in the style of Shakespeare's best. I was really excited when I heard it was getting made into another film (after the Japanese Death Note and Death Note: The Last Name in 2006), this time a re-imagining that moved the setting to America and is directed by Adam Wingard (You're Next, Blair Witch). However early reviews came out and it has been pretty much universally slated, as a fan boy would I look past the flaws of this latest effort, or would my love for the subject matter shine through and blind me to any alleged sins? I have never read the manga so any comparisons I make will be based on the anime as a forewarning. 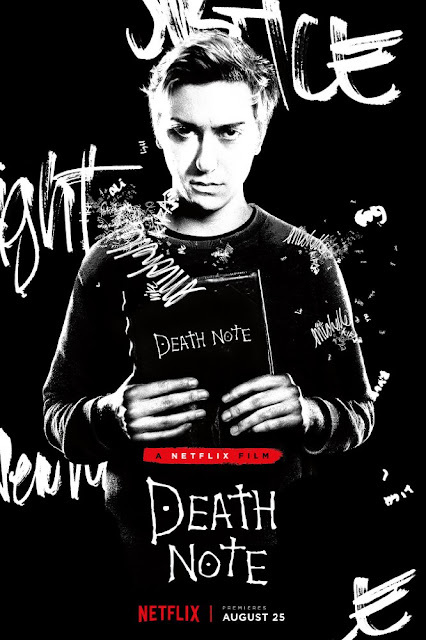 Light Turner (Nat Wolff) is an intelligent loner who ends up coming into ownership of a very strange book named Death Note, a book that belongs to Death God Ryuk (Willem Dafoe). He soon learns that whoever has their name written in this book will die and with this knowledge sets out to make the world a better place by culling criminals, having long since lost faith in justice after the man who killed his mum in a hit and run got off the charge many years back. However his plans start to go awry when his actions lead to a world class detective known only as L (Lakeith Stanfield) deciding to hunt down and apprehend him. Aided by his girlfriend Mia (Margaret Qualley) Light must find a way to stop L, before he is unmasked. I put it down to this movie being an hour and forty minutes long but events move very fast here, that is understandable to fit everything in, yet I do wonder how much sense it would make to someone who hasn't seen a previous version of the story. There are changes to the plot all over the board, the setting being in Seattle rather than Japan is the least of these changes. The Light of old was a charismatic sociopath, someone who was willing to do almost anything to keep control of the Death Note , I loved him for this, yet this Light is a lot different. The general story is slightly the same but it seems the character of Light is now split into two different people; him and girlfriend Mia. She stays alongside him and acts in a way that reminded me of Iago from Othello, always suggesting drastic actions, and when it comes down to the elements that make Light evil in the original it is instead Mia who carries out these acts. This Light seems barely in control, manipulated throughout and forced to take the blame for other characters actions. 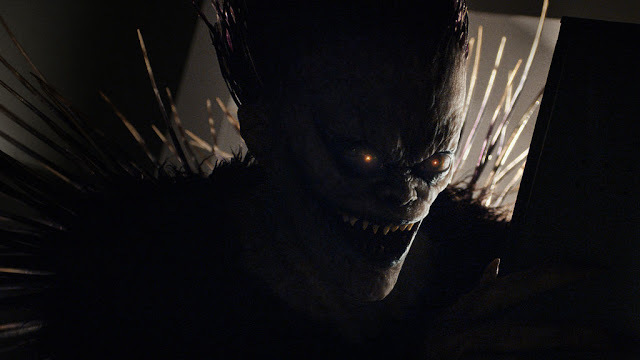 Ryuk was totally neutral in the original, he was just a watcher of events, there is a real sense of genuine malice to him here, he comes across as very sinister and horror like than before. I got the sense of a Faustian pact, all the Death God wants is people to die and he is not fussy who calls the shots. In the first place he tricks Light into using the book, later on when Light is trying to stop events spinning out of control Ryuk starts to threaten him, assuring Light that should he give up the book then his own name will be the first thing written in by the new owner. I also loved how previous owners of the book have written warnings about Ryuk in the margins. Ryuk is a fearsome presence and having Dafoe's distinctive gravelly voice was a perfect fit And then there is L, I detested him previously, I hated his odd ball ways and his refusal to see that what Light was doing was for the good of the people. Here he is much more messed up with huge personality issues that make him seem pretty unhinged in a dangerous way. This comes to the fore later on during a protracted chase sequence where he aims to kill the person he is pursuing. These changes all give different insights into familiar characters and sadly does make Light seem less cool. You are told Light is intelligent yet there isn't much of the cleverness you see in previous adaptations, without his ruthless streak there isn't much scope for him to appear on par with L whose investigation is solved within the space of about 20 minutes of film time. Death Note looks great, it has a constant high quality look to the camera work and some inspired scenes that add an element of awesomeness to events. A highlight was the investigation team all committing suicide by walking off the roof of a building, this scene was quite stylishly done. Deaths in general are pretty good looking with the trademark heart attack death only occurring a few times, it seems more that unless the method of death is specified it is up to Ryuk's discretion (here he is the one to cause the fatal events rather than the power of the book). There are a few moments of inappropriate musical choices that felt at odds with what was happening on screen but mostly the music choices worked well, especially at the start when it establishes Light's world. The plot is vastly different to the anime, starting off similar it goes off on such a tangent that it becomes almost unrecognisable. It leads to an ambiguous end that could easily lead up to a direct sequel, or indeed just be left up to the viewer to decide what happens in their own minds. I have to say the love story element wasn't very good, Mia was meant to be in love with Light, yet everything that happens seems to suggest she is only with him for the power he has. I guess you could say it is progress that she is the one manipulating him and not the other way around but it kind of negates his powers. This also applies to L who is so intent on stopping him that he refuses to listen to the pleas for help from the guy who is just in totally over his head. Basically each to their own, while Death Note is by no means terrible I just couldn't get on with the far more human Light, I just don't like how they ruined his character even if he did look the part. On the other hand Ryuk is fantastic here, I preferred him to how he was in the anime, he is an ancient God after all and so shouldn't be relatable. I also thought L was better here, morally closer to Light rather than intellectually. If you go into this with an open mind there is enjoyment to be had, I did enjoy this, though it left me with an inkling to go back and watch the anime. If you're not already a fan of the subject this will do nothing to change your mind.